Synopsis: America, 1809. Barely in his thirties, Meriwether Lewis, with his friend and partner William Clark, had led an expedition across the continent and back. He was a national hero, the governor of the Louisiana Territory, and he killed himself. 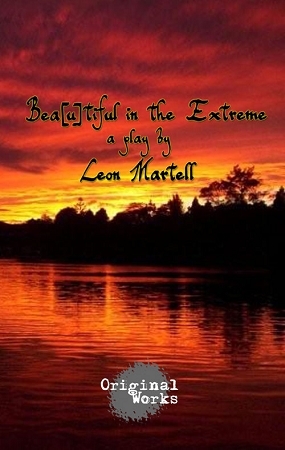 "Bea[u]tiful in the Extreme," his own words to describe the prairie, follows Meriwether Lewis as he wrestles the demons in his mind. Between the time of his first suicide attempt on a flat boat down the Mississippi, and his final self execution in an inn on the Natchez trace, Lewis relives the triumphs and trials of his epic journey. With Thomas Jefferson, his mentor, Sacagawea the native girl as his guide, and William Clark, his friend, anchor and in many ways soul mate, he struggles to find meaning in all he has seen and done. A warrior faces evil spirits, broken dreams, and politicians in his final battle. Whiskey, meat, laughs, and laudanum on the long trail to immortality.